A while back a Lindsy wrote me with a wonderful idea and I told her I would share it. Well, I'm finally getting around to that. Sorry it took so long. 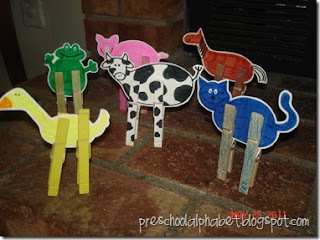 Lindsy, from Preschool Alphabet, sent me an idea to make some farm animals that your children can actually play with. Hers turned out so cute. I also thought it was great that this is something your children can have some fun with. The first step is to decide which type of farm animals you would like to make. Now here is the tricky part. Draw the animal on a piece of paper. I drew a cat--No critics! As you can see, drawing is not my strong point. There are probably places on the Internet to find animals and print them out. After you have your drawing it's time to paint or color it. I used marker, but paint will work just as well. When they are ready, cut them out. After Lindsy made her animals, she laminated them so that they would last longer. If you don't have access to a laminating machine, you could always use contact paper which is available at many places: Wal Mart, Target, craft stores, etc. I also thought if you are unable to do that, you could glue your animal to a piece of cardboard backing, like from a cereal box or gift box. That way it is a bit stronger. The next step is to get two clip clothespins per animal. Paint the clothespins the same color as the animals. When they are ready clip them to the animal. These little animals can give you children hours of fun. Check out all the ideas Lindsy had that could add more depth to these great animals. Thanks for sharing these! My kids really have a lot of fun making and playing with their clothespin legs :) Hope you're having a great summer! Oh my goodness, they are adorable. Wouldn't they be great for singing animal songs, too? I'll have to stopy over to Lindsy's site. Enjoy your day!